This is an unusual country. One would think, as Tjutčev did for his country, that this country cannot be understood, it could only be loved. Serbia is a big mystery. A country of border guards, in between worlds. The house in the middle of the road. The tower of holy warriors. The poem among nations. Yarn of the most ancient memories. This sun in our eyes, this bread on our palm. (...) This is how Serbia is described by its poets, in whom the drama and beauty of the Serbian area and Serbian destiny resonates deeply. A traveler, if he is open and curious, is often surprised to realize how precious cultural and historical layers on which modern Serbia rests are. The ancient times are here more ancient than elsewhere on the “old continent”. Chroniclers and scientists do not exaggerate when they say that the First Europe was right here, in the Serbian areas in Central Danube region, and that this is the land of the oldest known alphabet in the world. This series of Roman emperors who were born in Bal-kan provinces came into power at the times when “the crisis of the Empire entered the dark and irretrievable apo-gee”. The first millennium circle of Rome was just closed, cohesion forces weakened, basic values were undermined. Simple, forged in poverty, brave, they were growing up with the profound sense of honor and faith, bringing the original genius loci of these territories and legacy of great memory, they were building, all of them, their military careers on the basic Roman ethical principles: pietas, devotio, fides. In them we recognize ideal, life force and strength, which the Roman Empire was losing rapidly. 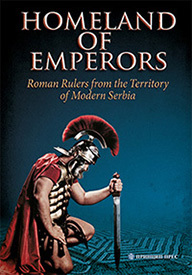 Having served faithfully to the Empire — says Milan Budimir — they deserved to become masters from subjects, and to dress the effort, hard-ship and sacrifice of generations of ancestors into imperial gowns, as a divine reward. Exactly this connection with the roots from which they had grown, kept bringing them back to the country of their birth. There they searched for eternal peace and memory. 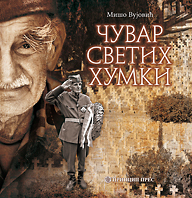 The best from Serbia, three languages (serbian, russian, english)! Land. The background and course of the battle, its heroes and tragedians, visible results and long-term consequences, important documents and heart-stirring personal confessions. Well written, scientifically based and lavishly illustrated monograph, in hard cover and full color. There is an ancient and deep image of Belgrade as a mythical town on holy waters. In all eras, it gave rise to numerous magical stories, puzzling legends from which, they say, the city is built. Why was Belgrade so important for the Serbs and why are Serbs so important to Belgrade? Why did they search for one another for so long, through millenniums and generations, and what really happened when they finally discovered each other? 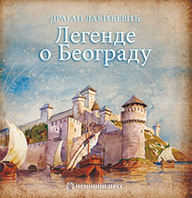 tion, dream and reality, the book of the most beautiful legends about the capital of Serbia, Serbian times and Serbian destiny. Hard cover, full color, with illustrations. re really the loves of that long series of famous couple? How did they branch out, blossom or wither in their own hearts? Through barriers of authority and complex obligations, titles and protocols, court curtains and mists over battlefields, did they manage to reach the other and themselves? A compelling and exciting book, reserved but profound, full of fire and inner vortices, subtle but perceptive. The book before you could be called an album, testimony, anthology of documents. It does not want to persuade. It does not propagate, does not impose, does not spin. It is not a PR, lawyer, blabby advertising agent. Neither is it a tourist reporter, steeped into phrases and the type of self-termination called routine. Just like on a long and beautiful old-fashioned journey, when you sit in a train and open curtains on the window, numerous images will be unraveling in front of you. Watch them calmly and with curiosity, as an explorer, with your eyes and eyes of those to whom you will be telling about the journey. Some of these images you will remember right away, the others you will occasionally retrieve and restore your fine connection, and maybe all of them will merge into one, into a large mosaic portrait of Serbia that you will carry forever. 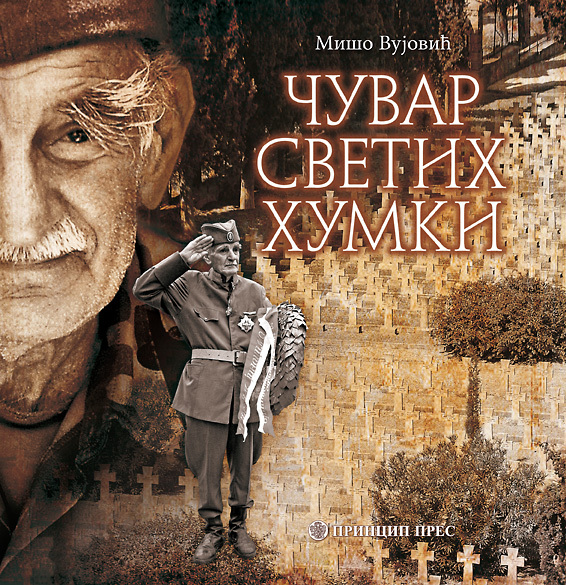 The new publication of the most beautiful monograph about Serbia, in separate editions in four languages (English, Russian, Italian and Serbian), with abundance of top quality photographs and texts written by great people of words. 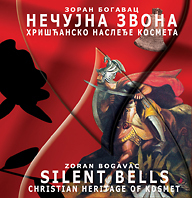 “The book of most beautiful landscapes of Serbia”, “painted with two hues of gold – Byzantine and Baroque”, “the book on perseverance of beauty and spirit despite scarce times”. 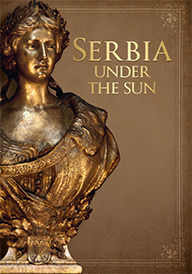 “The book in which Serbia itself unravels before our eyes, in its most lavish state”. Lavishly equipped, in hard cover and several versions of luxurious leather cover, printed on the best paper, with a possibility of hand made production of your unique copy! 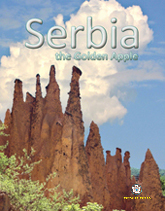 Presenting various aspects of Serbian history and culture, from prehistoric testimonies on exceptional cultures and civilizations in the territory of Serbia, through rich Roman and medieval heritage, to important contemporary events, “SERBIA, THE GOLDEN APPLE”, with its beauty and style, exceeds all books on Serbia published until today. 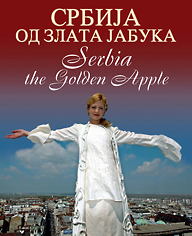 Just like good news travel fast, “SERBIA, THE GOLDEN APPLE” reached all continents and meridians, arousing enthusiasm and building a different image of this country, beyond the propaganda and other stereotypes. 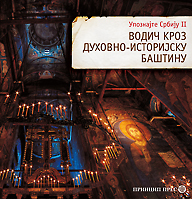 Volume Guide through Spiritual-Historic Heritage, also in ten chapters-topics, presents in a very interesting way various elements of grandiose Serbian spiritual heritage. Saints and anointed rulers, all Serbian dynasties, sacred images and temples, sacred mountains and waters, pilgrimages, holidays and saint days, visionaries and benefactors... A large volume of data, names, top quality photographs, renowned authors. A table book, guide, reference book. All this, and much more! How much do we really know about this country and this people, about their history and culture, natural beauties, important people, artists and works, cities, symbols, music, gastronomy, wines, humor...? Based on the belief that to know is a prerequisite for to love, edition “GET TO KNOW SERBIA” teaches us what we have not learned yet, reminds of what we have forgotten, and stimulates us to go to places where we have not been. Its volumes are pretty, practical, excellently written and lavishly illustrated. An excellent gift for you, your children, friends, business and other partners! Size of each volume: 19.5x19.5 cm. full color, wire bound, in a special box! In exactly half a century of existence, Dragačevo Trumpet Festival in Guča has grown into the most powerful brand of Serbian mass culture and become a true global hit, like Carnival in Rio. “Princip Press” has three publications on this event (and phenomenon). Guča. The National Festival of Serbian Jazz is a bilingual Serbian-English edition (format 23x21 cm, 120 pages), Guča. 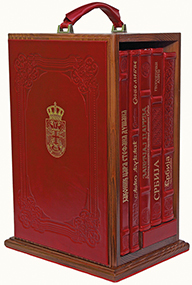 The Tin Soul of Serbia is in Serbian (format 15x22.5 cm, pages 160), and Guča. 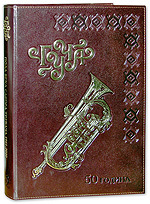 Half a Century of Trumpet Festival (1961-2010) is a luxurious monograph published on the occasion of the jubilee Festival (format 21x31 cm, pages 448). All editions are lavishly illustrated, with abundance of documentary material and live stories, with the best texts ever written or sung about Guča. Size: 20x20.6 cm. Volume: 288 pages. 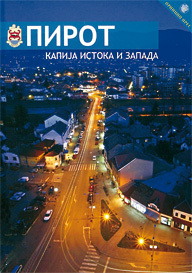 Book Fair in Banjaluka 2010. In a separate series, in its recognizable manner, “Princip Pres” explores cities in Serbia. Built as a guide book, history book, account, each of these lavishly illustrated books is dedicated to one city. It presents chronology of the most important events from the foundation of the city until present time, overview of history of its economy, culture, arts, sports, leads us through its sacral and monumental heritage, tourist offer, through all suburbs, to its rivers, nearby mountains, excursion grounds, spa centers... It introduces life and mentality of its people, humor, “local mythology”, works and successes of the most famous citizens. Books full of pleasant surprises even for people who live in those cities. 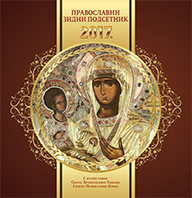 Exceptionally beautiful, large Orthodox calendar for 2015, with images of saint for every day. For each month in the new year, for each Serbian home, classroom, office! 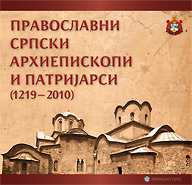 An exceptional book, the pages of which include biographies of leaders of Serbian Christian Orthodox Church, from Saint Sava to patriarch Irinej. Lavishly illustrated and exquisitely equipped, blessed. 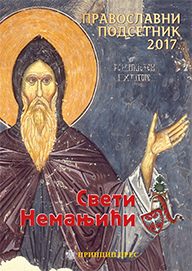 Orthodox Prayer Book, for each day a hagiography of the saint the day is dedicated to, space for your notes – all this makes another excellent edition of this publication, which should be your companion also in the upcoming year. Hardcover and with several versions of leather binding. The most comprehensive tourist guide of Serbia so far, a synthesis of the best European models, including an important and specific Serbian contribution. 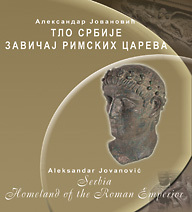 A voluminous guide through cultural heritage of Serbia, printed alongside in Serbian and English, this representative book has long been a bestseller in bookshops. “Not so much a guide through space as through time, less geography and more history and story, less a travel guide and more a reference book, less an encyclopedia and more an attempt to identify in Serbian heritage, more often tragic than happy, the civilization values preserved through centuries, what has marked the Serbs forever as a European nation and Serbia as an important European region.” In hard cover and several variants of leather cover, lavishly illustrated, written with masterful simplicity and reliable insights, this is a concise textbook on Serbian history and culture, the book for each Serbian house and library, in all meridians. 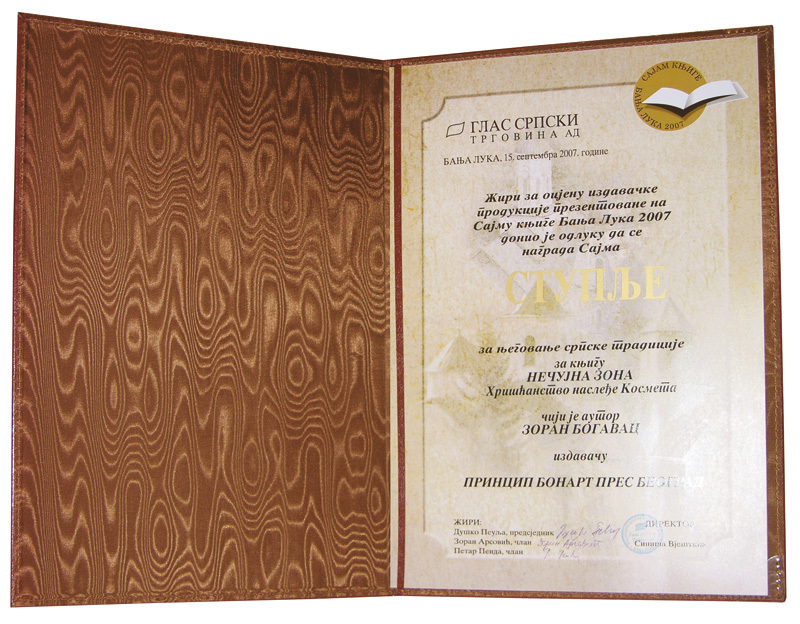 Award: “Gutenberg”, at the Book and Graphic Fair in Banjaluka, 2006. A three lingual edition in Serbian, English and German. A mini-guide through Belgrade with a map of the city center with the most important buildings and monuments of Belgrade marked and highlighted, and a map of Kalemegdan Fortress – both maps are adjusted to follow the text and the actual tourist’s walk through Belgrade. Three separate editions: Serbian, English and German. 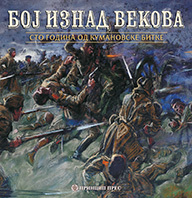 With its unusual dimensions, three-part cover, with texts condensed to only a few sentences, and its rich illustrations and practical information it provides, this pocket guide should be a truly popular edition, and especially useful to foreign visitors who are only passing through Belgrade, having time only for “Belgrade for beginners”. 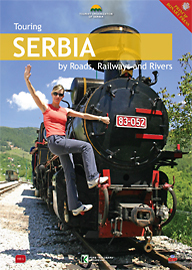 CORRIDOR 10 is a travel book – tourist guide that leads its readers through the Serbia’s most important travel route mapped as Corridor 10 on the European road network that connects eight European countries. This European transversal through Serbia follows a destination from Subotica to Presevo with branches towards Bratovci and Dimitrovgrad. The book is part of the international edition “European Roads of Culture”. Corridor 10 consists of Serbian and English parallel texts, and very detailed maps. Award: “Stuplje” (for nurturing Serbian tradition and Christian Orthodox spirituality) at the International Book Fair in Banjaluka 2007. Sirmium, Viminacium, Justiniana Prima, Mediana, Ulpiana... Serbia is a land of many persevered European archaeological sites from the time of the Ancient Rome. If excluded, the story about the rise and fall of the Roman Empire wouldn’t have been conveyed and completed. At the time when Roman Empire was divided administratively into Eastern and Western empires, which occurred during Emperor Diocletian’s reign, the capital of the East Roman Empire was situated in today’s Sremska Mitrovica. 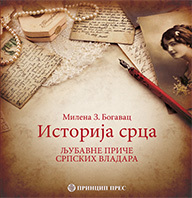 The book has two editions: in Serbian-English and Serbian-Italian. The book which, in Serbian-English and Serbian-German volume, in a creative and practical manner, in words and photographs, represents Serbia, its natural and other beauties, its heritage and tourist opportunities. One hundred places, one hundred challenges, one hundred most exciting adventures for those with curious spirit, journeys and events, people and landscapes. Find your reason!